Selfish for Love is the fourth installment of the In This Moment series. The books are all standalones, and don’t necessarily need to be read in order, however, I do recommend reading in order of release. It gives a better picture of unfolding events in each book as they do occur parallel to each other. The title alone is magnetic, being selfish for love, fighting for love when the odds are against you. This story follows Cat Shea and Lawrence Grier, who are meeting after a long time. From the get go, the discomfort between Cat and Lawrence can be felt rolling off the pages. Cat is now in a relationship(with Stephen), and learns Lawrence is back in town permanently. It doesn’t take Cat long to get tangled in her feelings for Lawrence once again. As much as she is pushing him away, Lawrence is pushing forward without taking no for an answer. 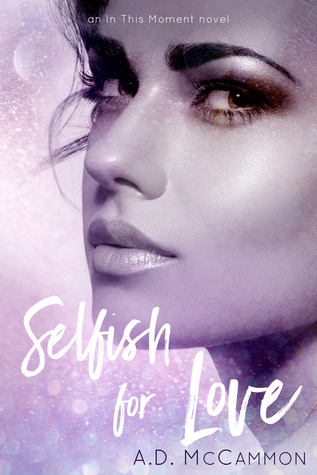 He is determined to get his love…hence the title, Selfish for Love. The author gives a tasteful and generous flashback in which Cat and Lawrence’s history unfolds. This story was a step away from what I would call a formulaic romance story. And that’s what really drew me in. The characters were weren’t perfect, they weren’t afraid of taking risks and making ginormous mistakes along the way. To me, that’s realism. And I love that. I was hooked to these characters simply by the way they were written, real and raw. And the author doesn’t skimp on character development. I had no questions or holes to fill in at the end of this book. Other than claiming your love by any means necessary, another thing I took away from this story was forgiveness. Cat was able to work out her issues, change her perspective on things and apologize. That showed the magnitude of her heart. As a reader, I don’t want a typical Hero/Heroine at the beginning of the book, I want a flawed character that experiences progression. This story did not disappoint. It also packed some emotional punches too, a trait A.D. does quite well. I get wrapped up in their heads and find myself sympathizing with them as if they were my friend or neighbor. If you haven’t already started this series, what are you waiting for? I had the opportunity of asking the author some questions about Cat & Lawrence and also what’s next for her. Keep reading to find out what she says. 1) Congratulations on the release of Selfish for Love. I must say with each release your writing is becoming better and better. I feel like you can effortlessly write any story you want to, although I am privy of the hard work that goes on behind the scenes. So tell us, did you always have Cat’s story figured out while writing the others? Or did it come to you later on? When I originally started writing Cat’s story, I had very different plans for her. But she’s stubborn and wanted things her way. I struggled with this story more than any of the others, starting over at least three times before taking a step back to write In the Gray. It was Lori’s story that helped me to finally understand and connect with Cat in a way I hadn’t been able to before. Then it just came pouring out of me. 2) I’ve always said Eric(from Crushed) is my favorite dude in your series, but I think Cat is my favorite gal. She’s a bit more impulsive than the rest of the girls. How hard was it to work on Cat’s persona compared to your other heroines? Each of my heroines have different aspects of my personality. Cat possesses my passion and empathy. Though, I can’t say anyone would ever call me impulsive. Lol. I think each of them have been equally eye opening. You can learn a lot about yourself by looking at your flaws and attributes from an outside perspective. 3) What’s next for you? More In This Moment books or something entirely new? New genre perhaps? I’m taking this year off from publishing, but I do hope to get some writing done. I actually have a couple of thrillers planned. And, I’ve been writing some poetry. Though I’m not sure I’ll ever be brave enough to share it. Feels a little like letting someone read your diary. As for the In This Moment Series, I’m not planning to write anything else. That could change, maybe a novella or two. But, I need a break. Something new. 4) One thing I really admire is how all of your books are interwoven, some stories running parallel to each other. Did you have everything mapped out beforehand? Because I’d go insane trying to connect everything together. Not at all. No planning or mapping of any kind. Unfortunately. Maybe I do have an impulsive side after all. Lol. Before I started writing In This Moment, I had several works in progress. Two of those being Julianna and Cat (although they weren’t originally named Cat and Julianna). It was my intention to write them as standalones, but as I was working on Lizzy’s story, these characters that I’d been developing for years starting popping out. So, my standalones turned into a series. And I did indeed go insane. There was a lot of cursing. It is very hard to make sure that everything lines up just so. Especially when you hadn’t planned it out. It also limits you creatively. It’s been an interesting ride. 5) Since we’re discussing romance, what kind of first date would you send Cat and Lawrence on? A first date… that’s a tough one. Cat and Lawrence have never had a typical courting relationship. So, I don’t see them going on what we would consider a traditional date. They would want to keep it lowkey. No dressing up or fancy outings. Maybe something outdoors and secluded. Perhaps, dinner under the stars, or a hike through a state park. You can keep up with A.D. McCammon via the below social media links. Also included are links to purchase her In This Moment series. As usual, thanks for stopping by.